Dallas City Councilmember Angela Hunt and Deputy Mayor Pro-Tem Pauline Medrano revealed a program Tuesday to transform two blocks of Lowest Lower Greenville Avenue from a late-night 20-something hotspot into a pedestrian- and family-friendly destination. "Lower Greenville is an area ready for change," Medrano said. "It's no secret Lower Greenville area has had its share of challenges in recent years and the overconcentrated, late-night bars has eroded the quality of life of surrounding residents who have had to live with the resulting noise, traffic, vandalism, and most concerning, is the crime." The area between between Bell and Alta streets, known as Lowest Greenville, has often drawn criticism from residents who complained the nearby string of bars brought nothing but trouble -- especially after midnight. To a certain degree, they have a valid point. Deputy Police Chief Mike Genovesi said the police department currently staffs an additional 20 officers to that area on Friday and Saturday nights to help curb the spike in crime after midnight by well-lubricated bar patrons and those who may rob and shoot them. Plans for a new, redeveloped Lower Greenville are revealed in Dallas. So what is the plan for a new Lower Greenville? "First, we've got to bring back some balance to the mix of businesses in the area and give the city and nearby residents input into the types of businesses that operate in this neighborhood late at night," Hunt said. "To accomplish that, we're going to create a planned development district that will require businesses operating after midnight to obtain a special permit from the city. We're very proud that this proposal is supported by all six of the surrounding neighborhood associations as well as the majority property owners along Lower Greenville." Proponents hope the new permit process, which must be approved by the city council, will reduce the need for police resources in the area. "The permit process will ensure that businesses operating after midnight are mindful and respectful of those who live in the neighborhoods directly behind their businesses," Medrano said. "The combination of zoning changes and beautification improvements will indeed help energize the area and make it a key economic engine for our city." 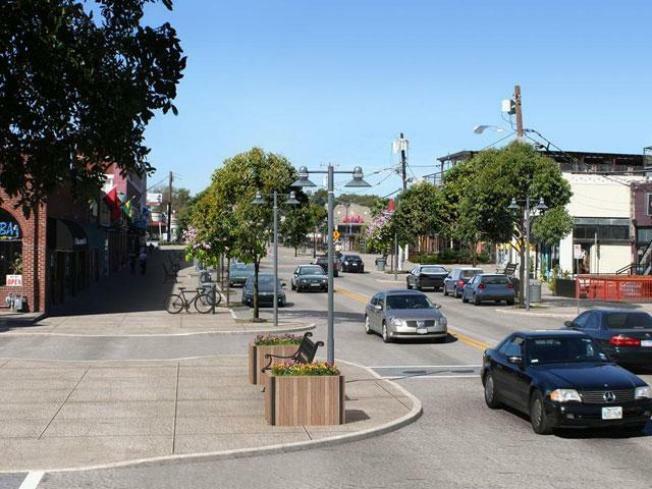 "The second part of the solution is to create a beautiful, walkable street," Medrano said. "We're going to build a better Greenville Avenue, block by block, with wide sidewalks, street trees, new lighting, enhanced crosswalks and street furniture." What are street trees and street furniture? I'm guessing she means landscaped sidewalks with trees and benches. "This popular area has had many challenges over the years, trying to find a balance between safe neighborhoods and thriving businesses," Hunt said. "The effort we’re launching today will demonstrate that both can coexist by creating a better use of space while enhancing livability." 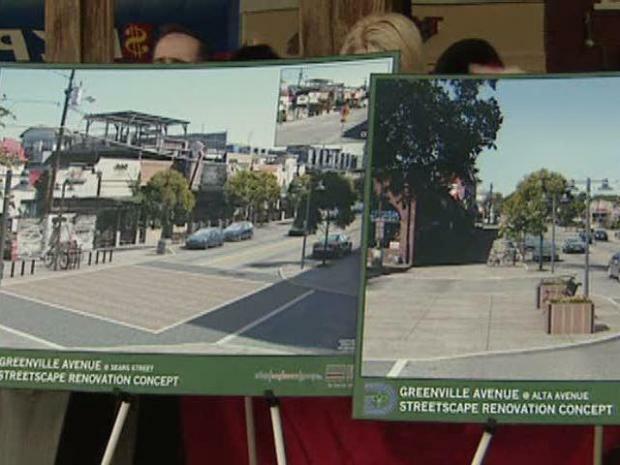 The plan will narrow the lanes of Greenville from four to two and provide room for sidewalk cafes with patios and plenty of room for bike racks. In addition to that change, the site where the Arcadia Theater once stood may have a more permanent tenant, according to DallasNews. Jonathon Hetzel, of Dallas' Madison Partners, wants to build a food-truck trailer park, a la Austin, complete with Airstream trailer/restaurants. Hetzel told the Morning News they ware working with the city to get the proper permits in line for the project. The site is currently being used as a garden. The development will be done with $1.3 million in 2006 bond funds. Construction is scheduled to begin in spring 2011 and should be completed later in the year.